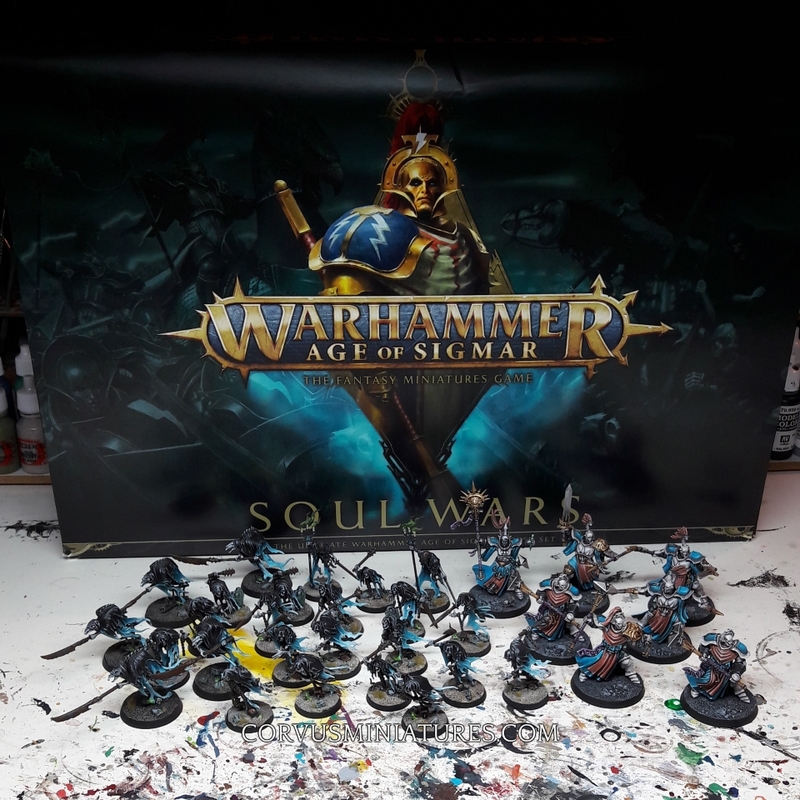 I received my Soul Wars box from Element Games the first week of July. The timing was perfect, the coming summer holidays would offer me plenty of time to work on this project. 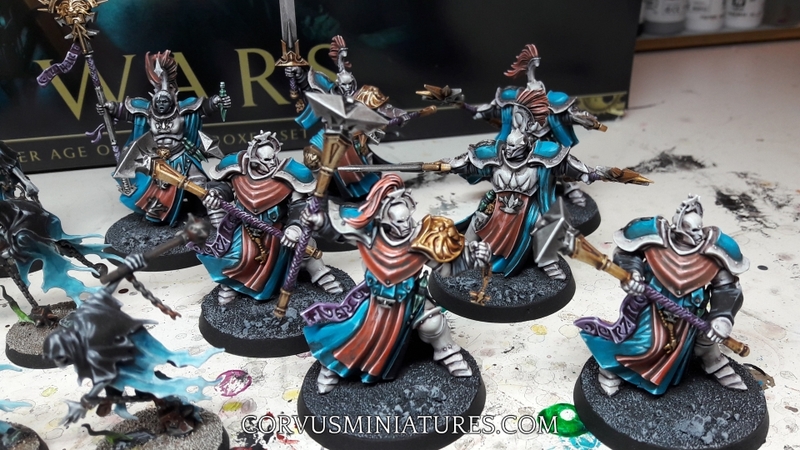 Although the weather is stil quite mild here, autumn is waiting around the corner I thought it would be nice to bring you all an update on this project. 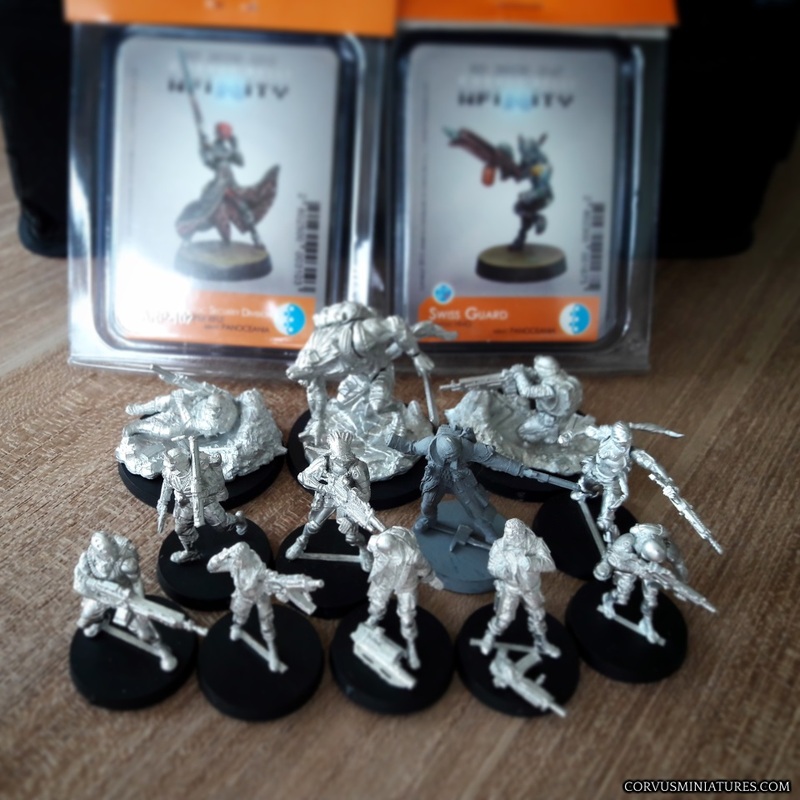 I managed to assemble and paint one batch quite quickly. 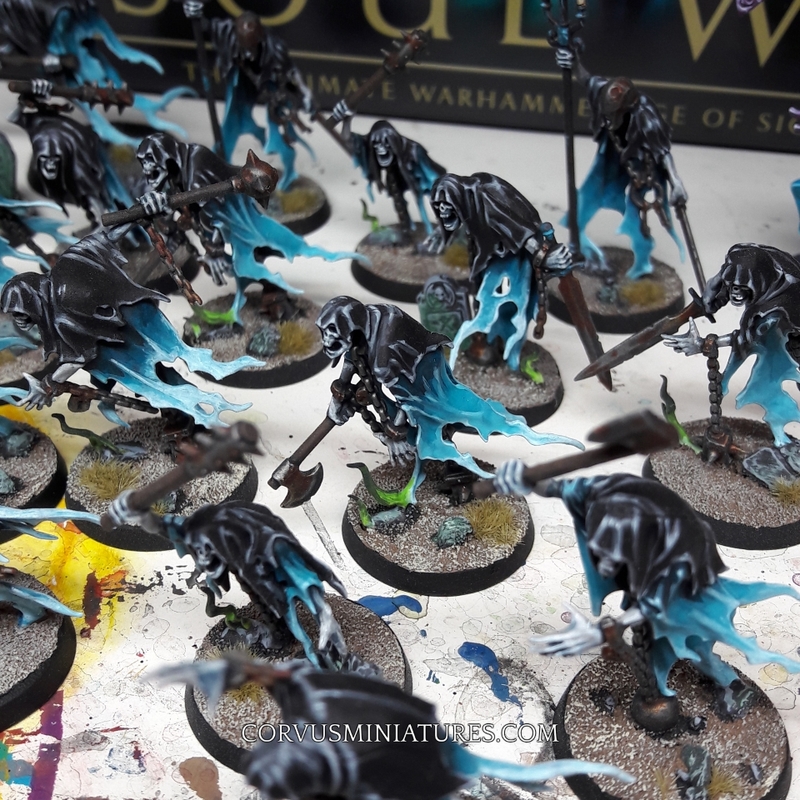 After that I focused on assembling and priming the other 10 Chainrasps, a batch of 5 Glaivewraith Stalkers and the 4 Grimghast Reapers. 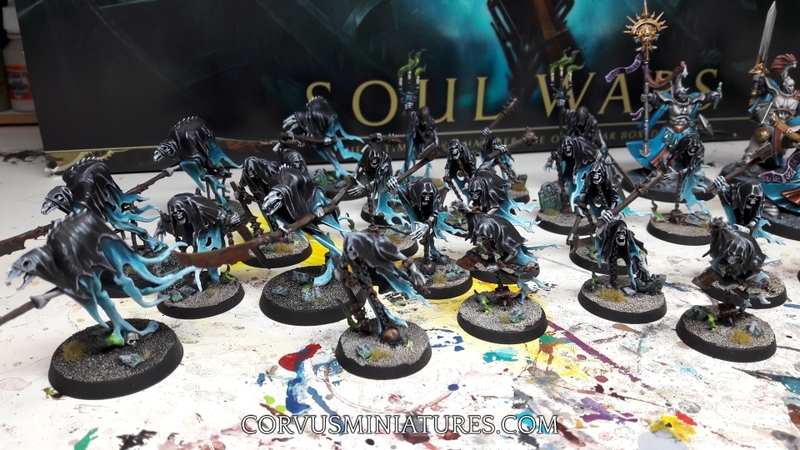 This would give me enough material to paint during my holidays 🙂 During the painting of the Nighthaunts I also spent quite some time assembling most of the box set. As a result, today only the mounted characters are left to do . 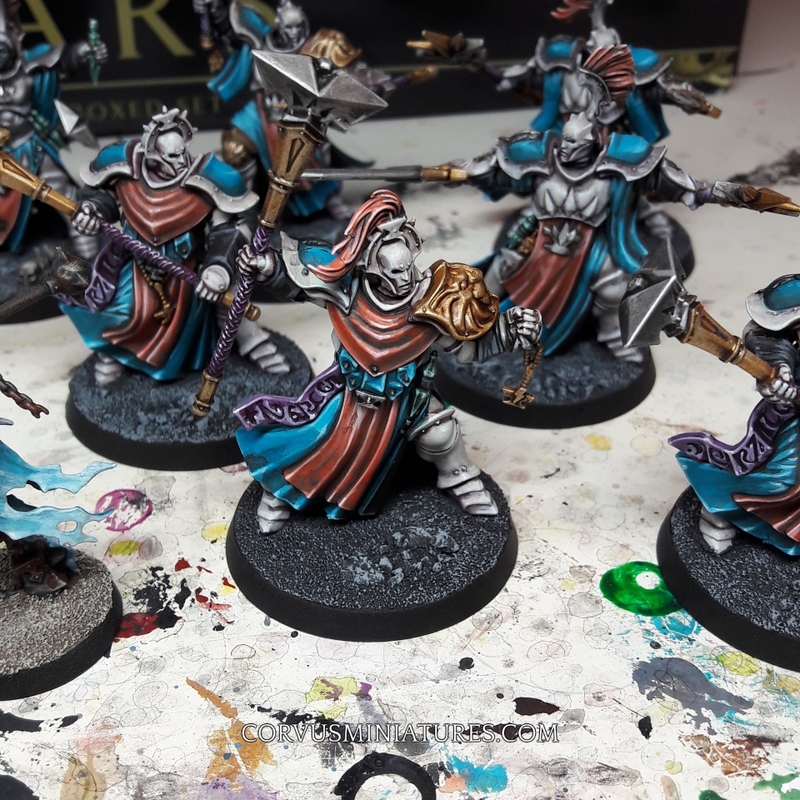 So I did quite some work at that point, but I decided to switch to some Stormcast Eternals before starting the Grimghast Reapers, simply not to get bored-out with all the black and turquoise. 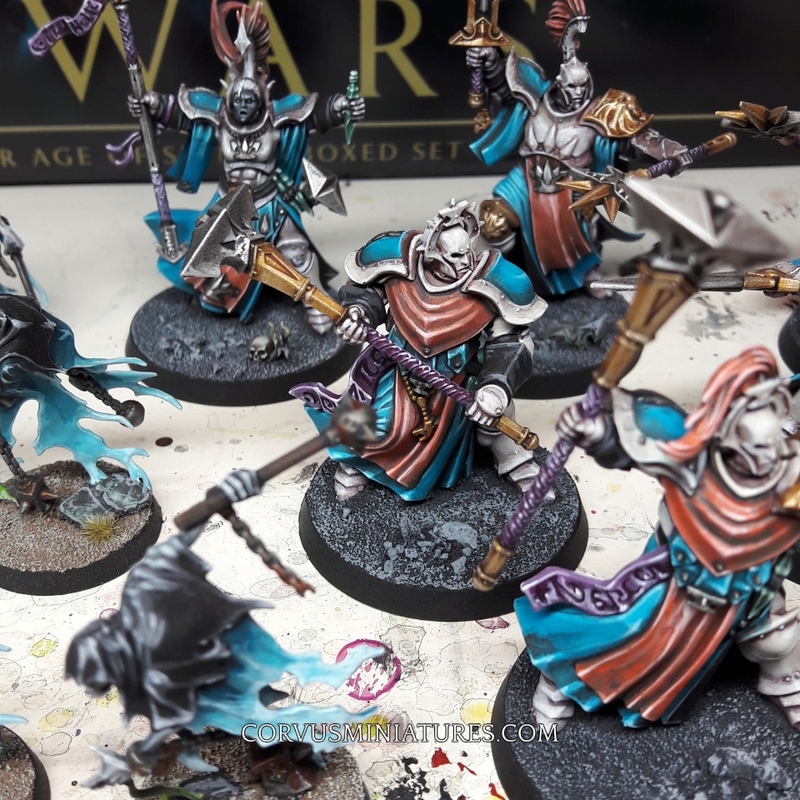 They are larger models with a lot more detail so take up a lot more time to paint. Hello all! 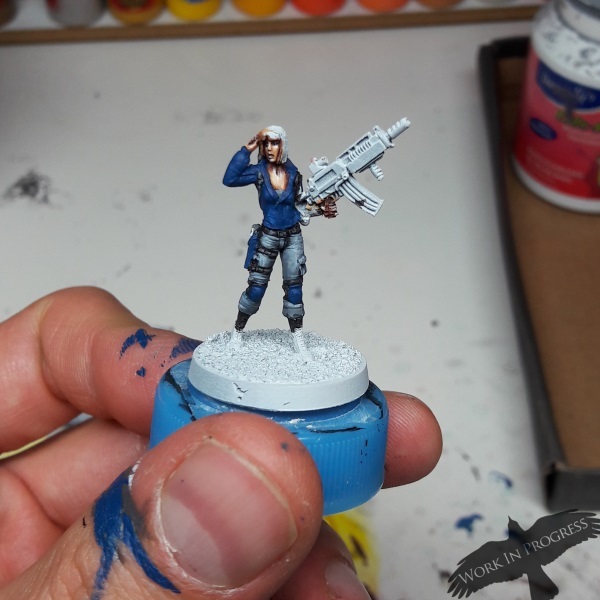 I am making another return to painting Infinity, again as a commission. 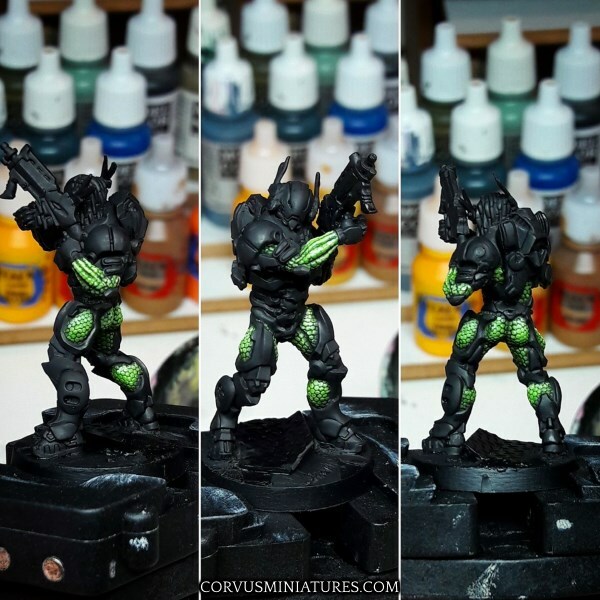 The customer wanted to have a neon green with black color scheme. 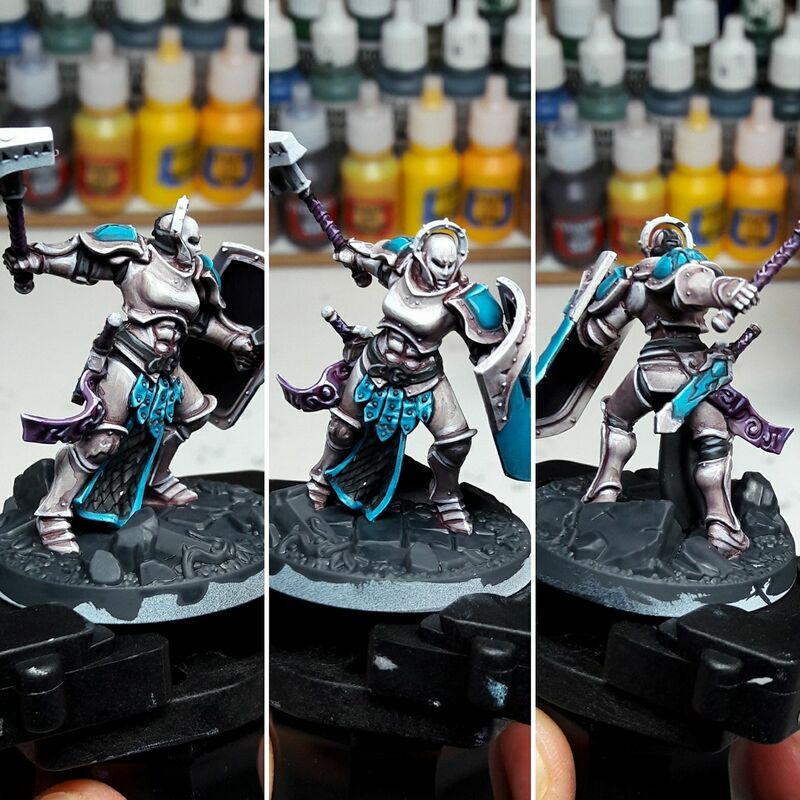 At first I wasn’t all too convinced of painting the underlying hexes/chainmail material this way, but I’m glad I did, I think it looks great! This first model is 90% done. 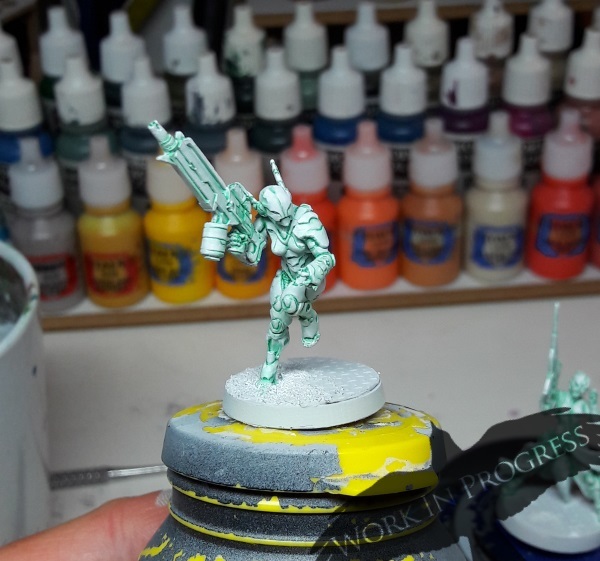 I painted it first as a test model. 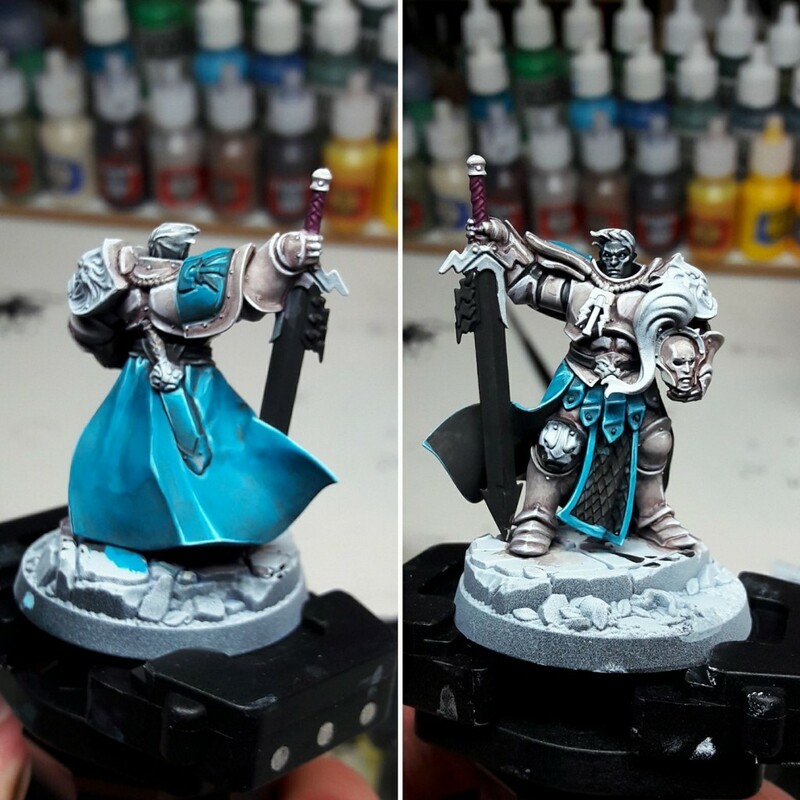 After this we decided to continue with this color scheme. 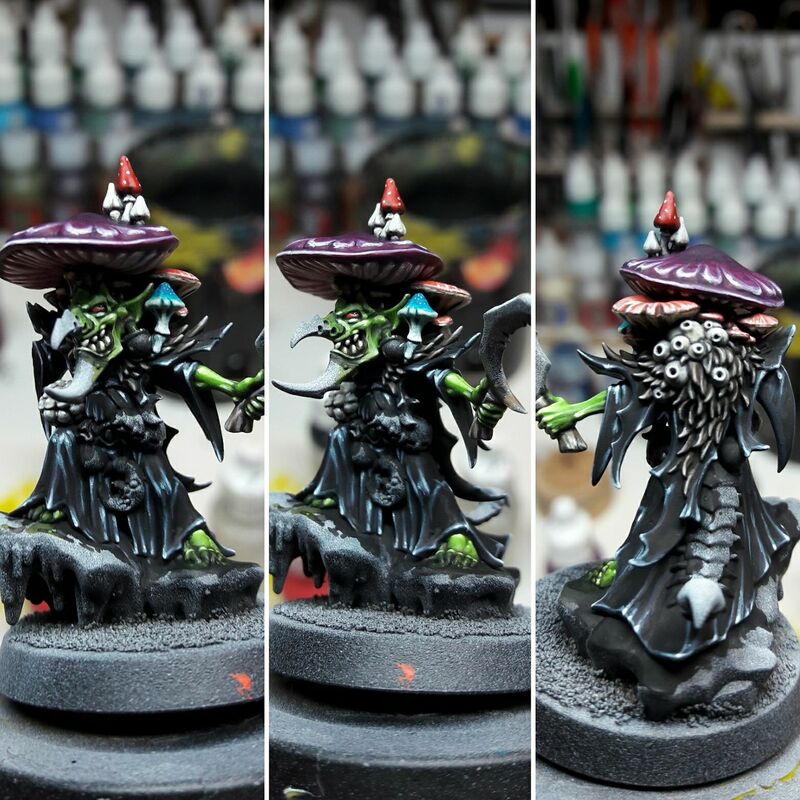 After they were finished I started working on one of the latest GW figures: the Fungoid Cave Shaman. 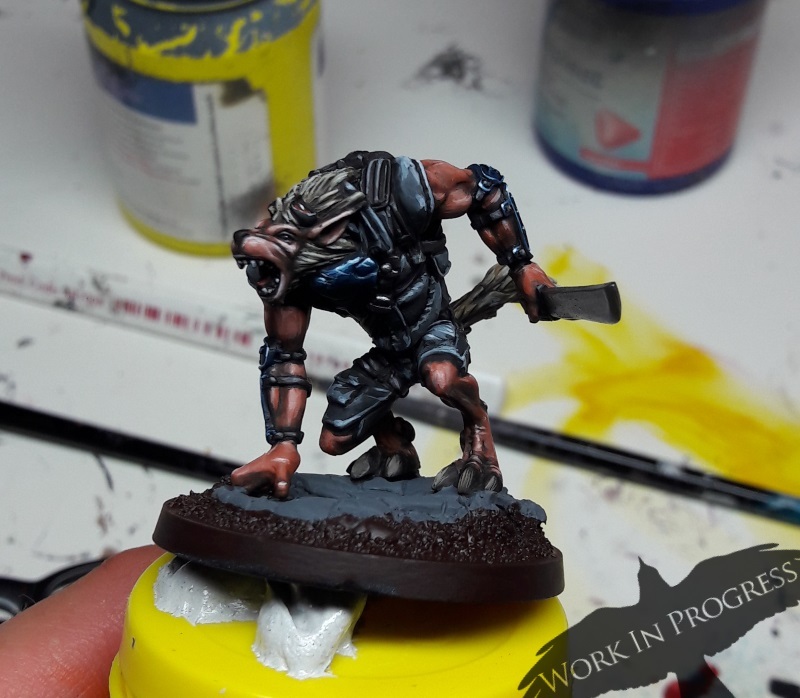 The idea was to enter it in my local gamestore for the Malign Portents painting competition, but because I am spending way more time on this figure than initially estimated, I will most likely not be able to enter him in time. Nonetheless it will be a great addition to my display cabinet once finished. 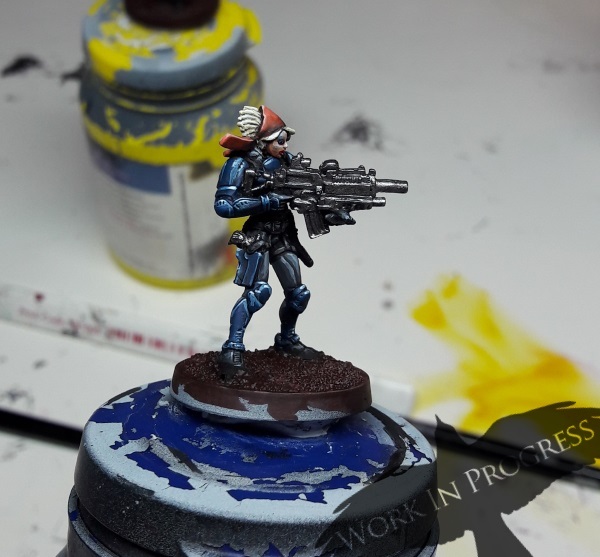 This figure is a joy to paint, with lots of different surfaces and colors, and very challenging to find a good order to paint the different parts. 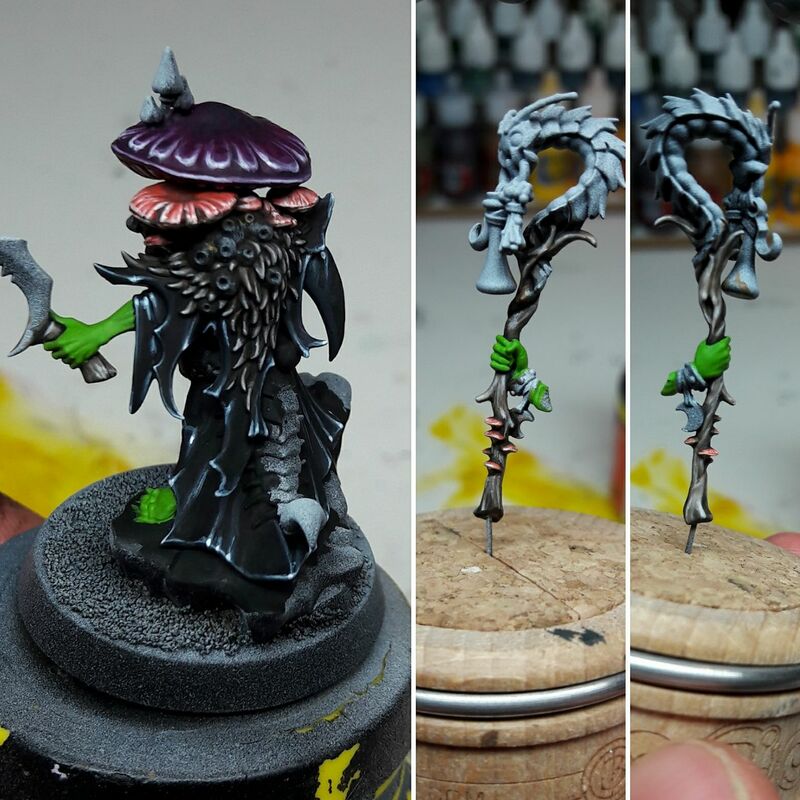 I decided to paint the staff separately. 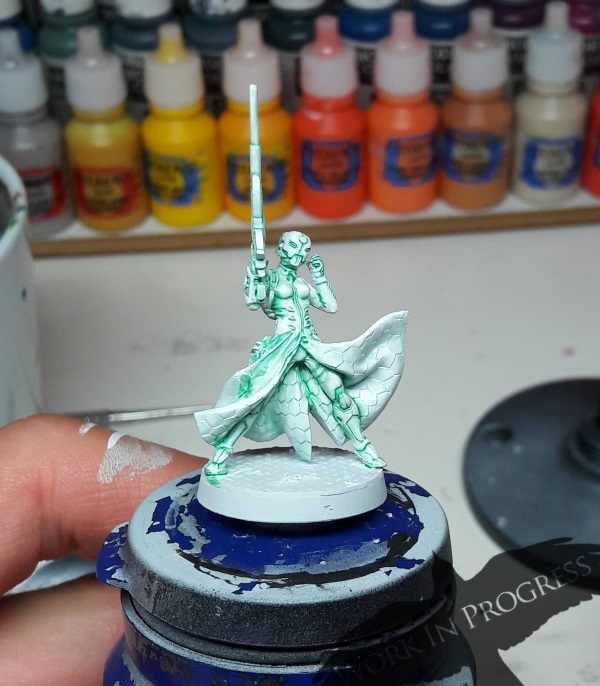 Currently working on the second batch of Arianda figures of this commission. Check out the finished first batch here. 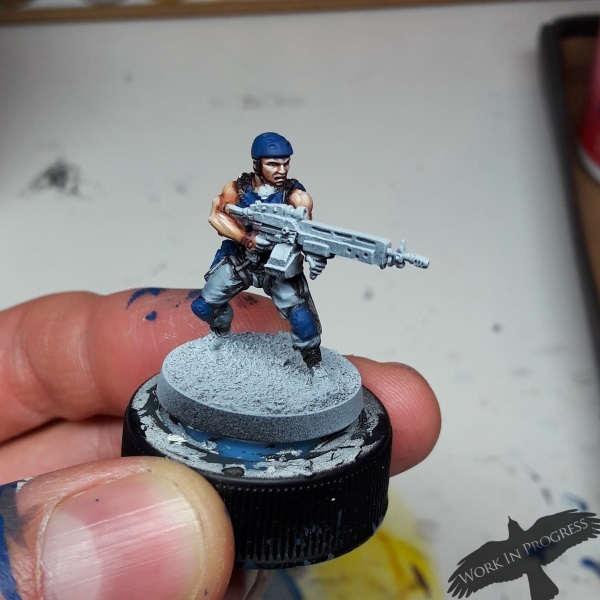 Going with the same color scheme, but where I painted all the armour blue previously, I am now faced with figures without armour. So their coats and jackets will be blue this time, together with some details. 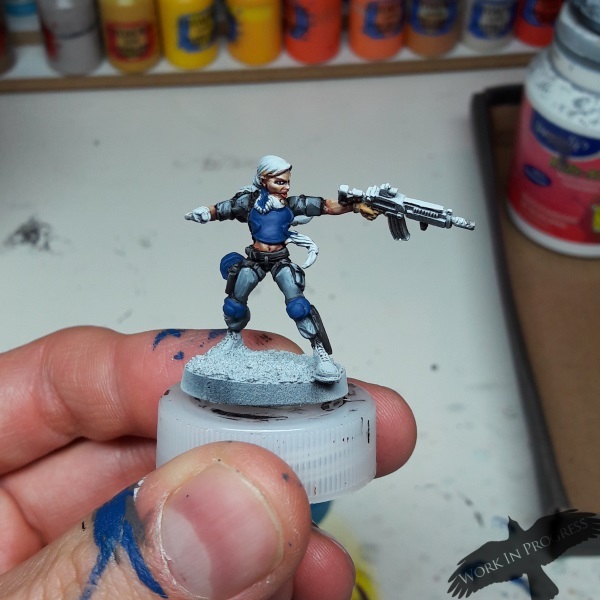 Last month I was contacted by someone who has been gaming with his unpainted Infinity miniatures for a while, but now wanted them painted. Of course I was happy to accept this commission because small skirmish forces like his are right up my alley. 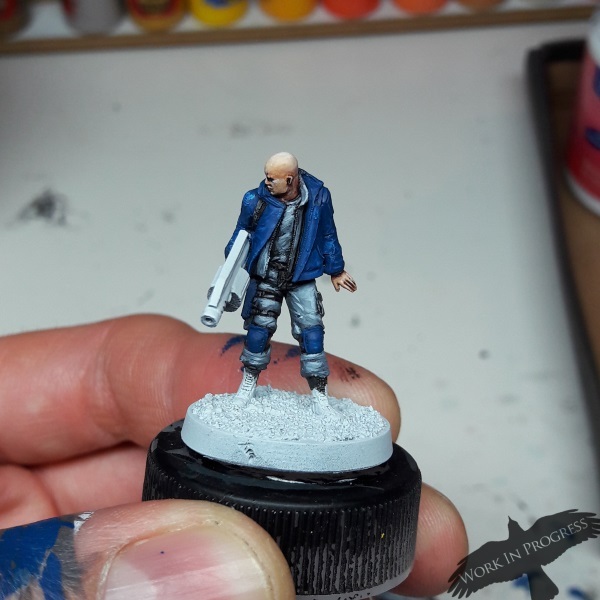 By the way if you want to have something painted by me, you can get more information here, or simply get in touch: info@corvusminiatures.com. 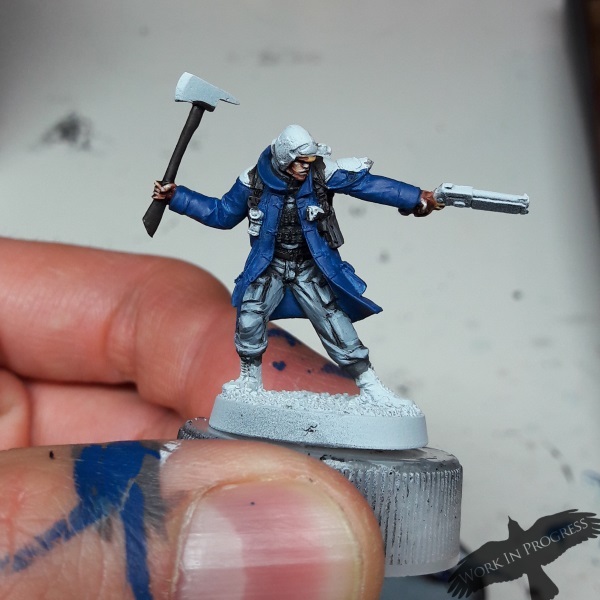 The major part of the commission are the miniatures he is already using: Ariadna. 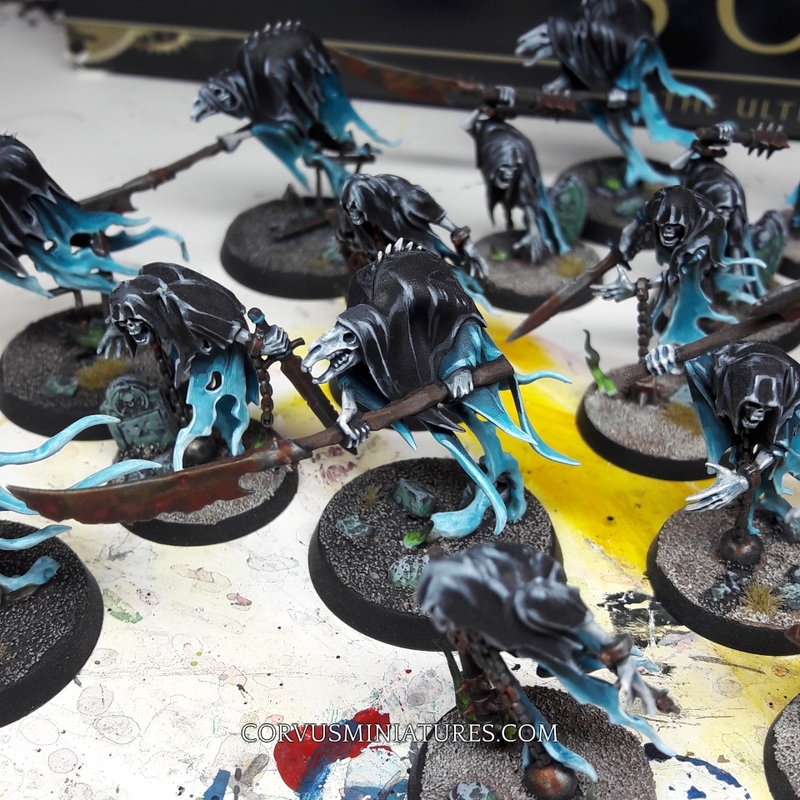 To be honest these models weren’t that expertly assembled, so I spent quite a bit of time cleaning them and removing and re-attaching (with pinning this time!) parts where necessary. To give you an idea none of the miniatures were glued to their bases, simply stuck in the slotta base and the large scenic bases were stuck on there with sticky tape. 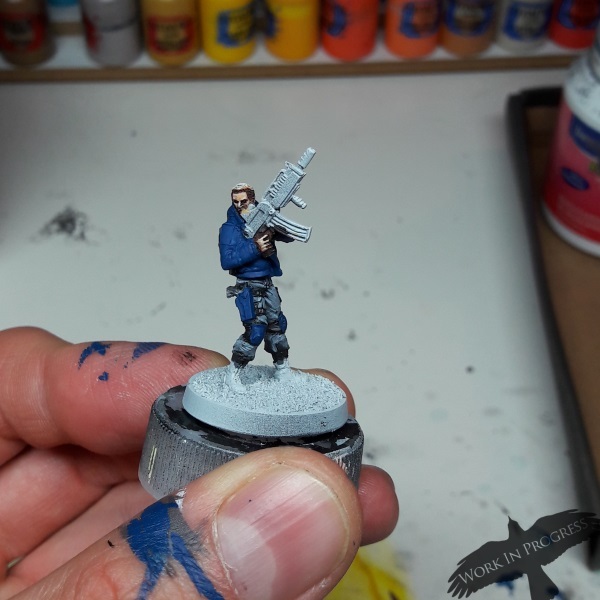 But I don’t blame my customer for this of course, these aren’t the easiest miniatures to get started with if you are new to the hobby. The other part are two PanOceania blisters, which will become my customer’s second force I think. Another great thing about this commission is the fact that my customer provided me with a lot of reference material. He mailed me a zip file with lots of images, word documents, etc. 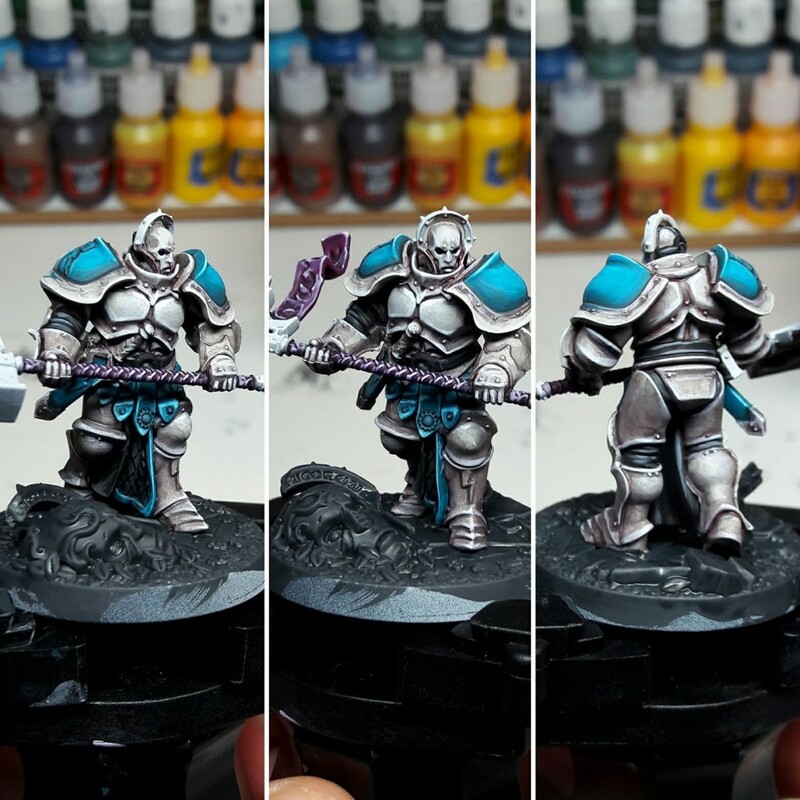 Quickly I had an image in my mind of what I (and hopefully he too) wanted and got started with four of the Ariadna figures, which are all a joy to paint. 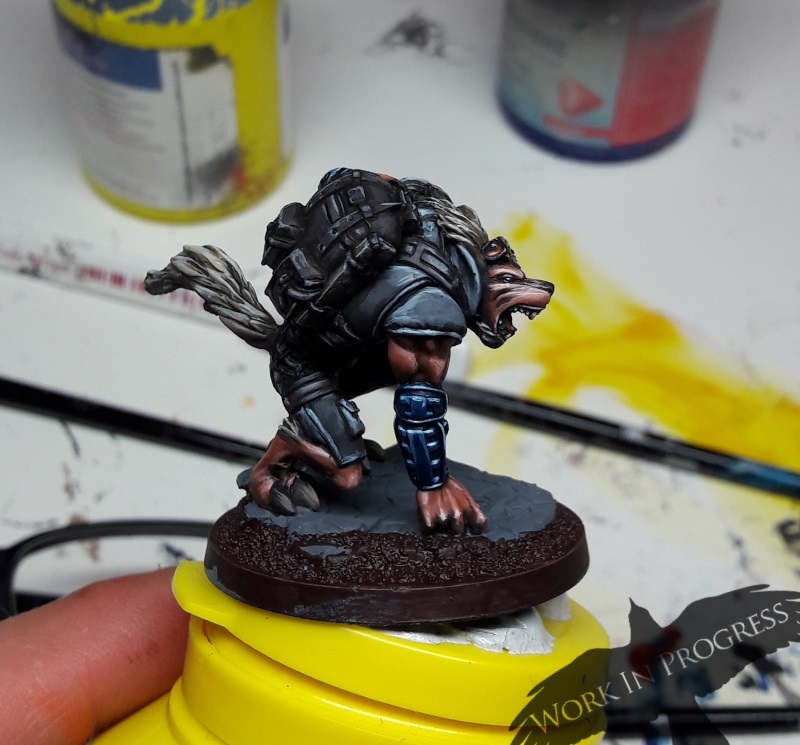 Especially the wolf-guy is fun to do. 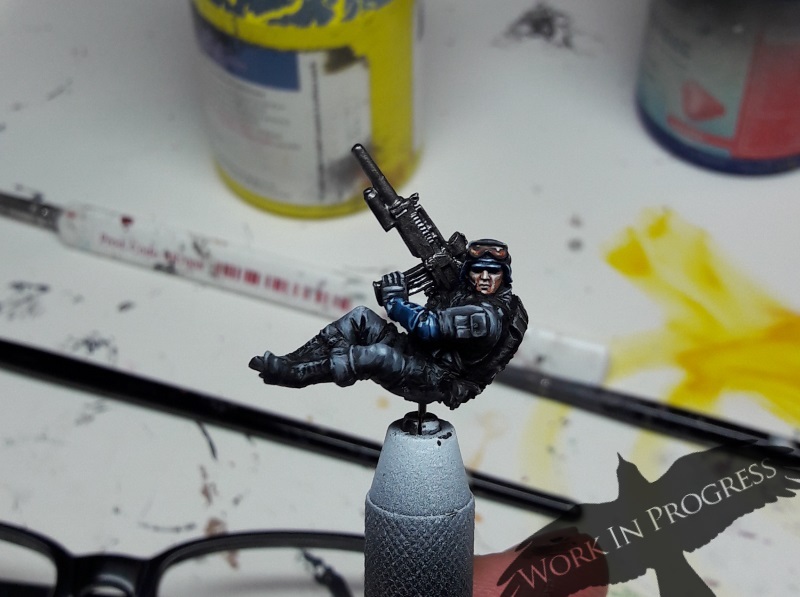 I also like the face of this sniper a lot, it’s very well sculpted! The PanOceania figures are something completely different. 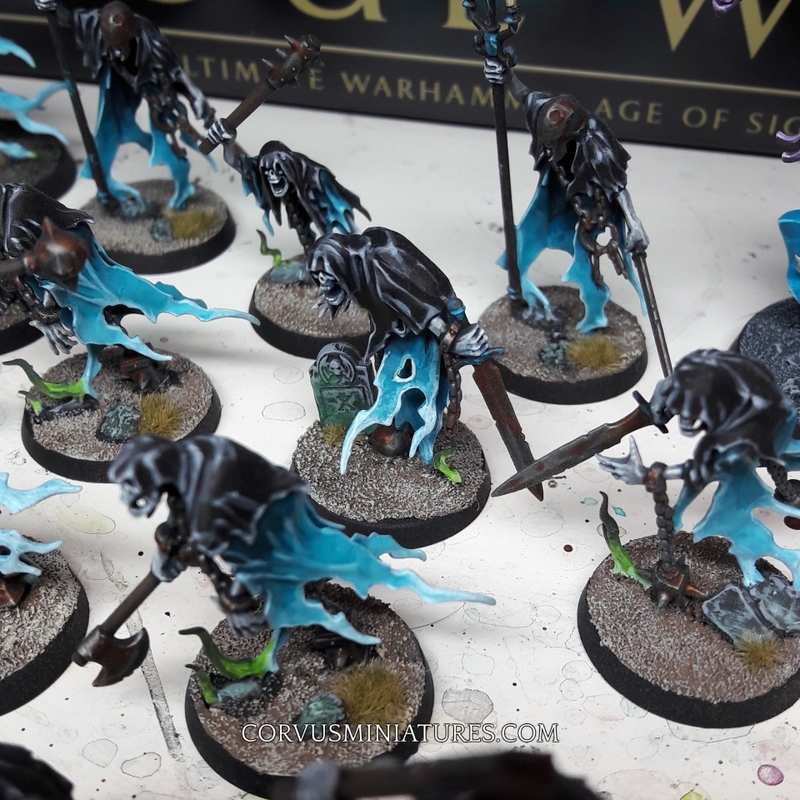 The idea here is to have them look like ghosts, like they are wearing some kind of cloak armour. 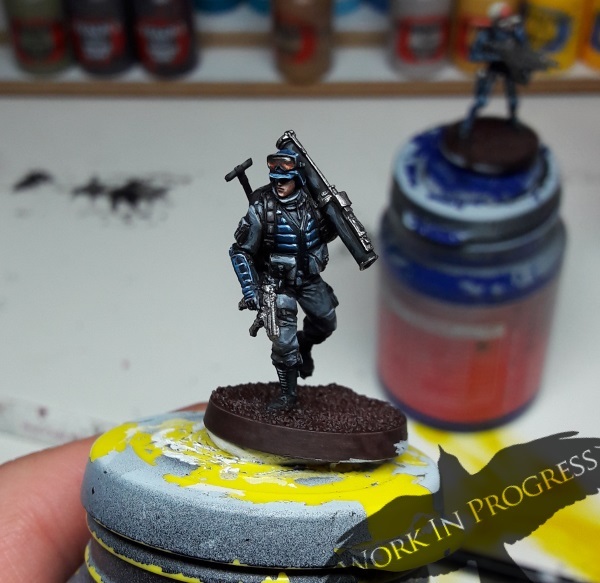 More on the progress in a next blog post. Take care! Use referral code GER959 for double Element Crystals (store credit). 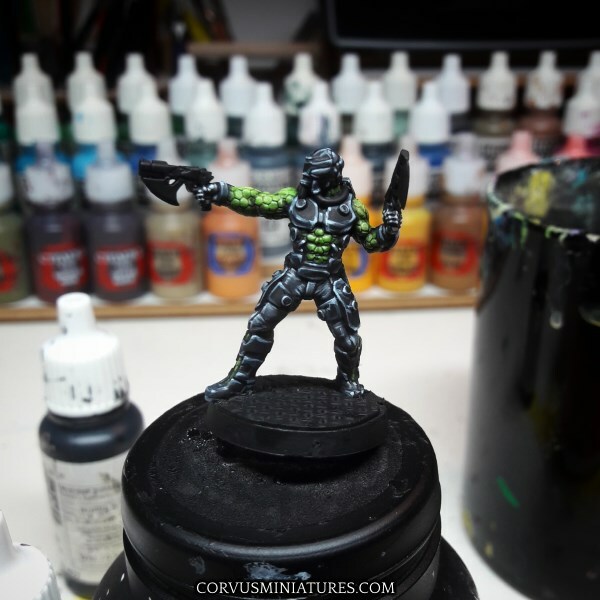 Copyright © 2019 Corvus Miniatures - painted sf & fantasy miniatures by Gerrie Schenck. Proudly powered by WordPress. Blackoot design by Iceable Themes.